Most Democrats don't expect the former president to just sit around. He's too young, too savvy, too restless. 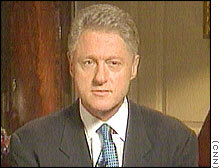 Clinton's tenure was marked by investigations, impeachment and this TV apology for misleading the nation. Yet he says he enjoyed being president. WASHINGTON (CNN) -- On a cold day in December, Bill Clinton was holding court in the White House briefing room, as he has done dozens of times over the past eight years. But with his presidency down to a few days, he was having a particularly good time. "I have loved these eight years," a relaxed Clinton told reporters. "You know, I read in the history books how other presidents say the White House is like a penitentiary, and every motive they have is suspect. Even George Washington complained he was treated as a common thief. And they all say they cannot wait to get away. "I don't know what the heck they're talking about," the president said, as those in the room burst into laughter. Those might seem like odd words from a man who seems to attract controversy the way a magnet draws iron filings. 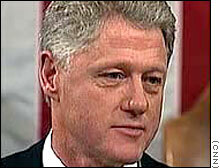 Bill Clinton, after all, has been impeached and acquitted, placed under near-constant criminal investigation, threatened with disbarment, made into the poster boy of bad character by some political opponents, and generally subjected to a sort of political arc-welding treatment since walking into the White House in January 1993. He is still standing. Many of his one-time opponents are not, and that might be the truest measure of the Clinton presidency. He is a survivor. Almost everything else can be hotly debated. Clinton has always defied conventional analysis. Other than the resounding success of the economy during his eight years -- no small accomplishment -- and some international policy victories, it is hard to point to a sea change in the political world that can be traced to the president. His accomplishments are largely noted for their moderation, both in their position on the political scale and their scope. But Bill Clinton the politician does not trigger moderation in his friends, or in his enemies. He is a love him-or-hate him president: People look at him and see what they want to see, and can find evidence to support almost any viewpoint. The Clinton presidency was wildly successful (strong economy, unheard-of government surpluses, drops in poverty, international policy successes) and/or a huge failure (a lingering national health care crisis, an allegedly crumbling military, a humiliating and sordid presidential impeachment, a nation that wonders what "is," is). The president oversaw a nationwide drop in crime even as an independent counsel studied every aspect of the president's life. Clinton spoke movingly and often about individual responsibility and the ability of Americans to fulfill their dreams, but his critics point to his own personal behavior as precisely the kind of character Americans should not want in a president. The contradictions continue. Clinton is, after all, a Democrat -- the party critics associate with large government and insensitivity to business -- but he oversaw one of the healthiest economies in the nation's history and kept government growth in check. He is a former small-state governor who has built strong personal friendships with many world leaders. He is a man with an extensive Bubba vocabulary who proved repeatedly that he could discuss macroeconomics in numbing and precise detail. And he is a person whose occasional penchant for trouble and seemingly inexhaustible ability to recover made him capable of dive-bombing his greatest victories -- and then building something even stronger out of the rubble. His happiness and suffering were often very public, and sometimes the two contradictory emotions seemed to come 30 seconds apart. Clinton pressed forward as those around him often seemed to become disappointed, turn bitter, get out of politics, and perhaps even head to prison. Skip Rutherford, a Little Rock friend and adviser of Clinton's for nearly 30 years, thinks he understands why Clinton is so resilient. "He has always had to swim upstream. The odds have been against him from Day One," Rutherford said, noting Clinton's modest Arkansas upbringing. "As people kept dropping depth charges and sending torpedoes at him, they just never brought him down." After his State of the Union address in 1998, in the middle of the Lewinsky scandal, Clinton's job approval rating reached 66 percent, higher than it had ever been. Clinton's penchant for trouble was evident almost from the beginning of his term. Within weeks of taking office he was enmeshed in a controversy over homosexuals serving in the military -- a controversy that spawned the "don't ask, don't tell" policy and seemed to sap some energy out of the administration almost from the start. There were other problems in the first few years -- the Branch Davidians in Waco, an independent counsel appointed to study an Arkansas land deal that involved the president and first lady, the suicide of Arkansas friend Vince Foster and arrest and imprisonment of Arkansas friend Webster Hubbell, the ugly collapse of a plan to essentially nationalize health care, the loss of Democratic control of Congress, a controversy over the firing of the White House travel office staff, the mysterious appearance of FBI background files at the White House, and more. But the president continued to stand. Many of those who helped carry him to the White House in the 1992 presidential campaign were gone from the White House two years later -- often replaced by the kind of inside-Washington players that the Clinton campaign once said it stood against. But Clinton nonetheless appeared to grow stronger even as his party weakened. After the government shutdown of 1995 -- which the public widely blamed on the Republican-controlled Congress, although a good case could be made that it was a mutual effort -- Clinton seemed to be at the peak of his support and power. Then came the Monica Lewinsky scandal. His House impeachment sparked an actual Democratic pep rally at the White House. His public support went up even as the Senate acquitted him on the impeachment articles -- and the support held. In mid-December 2000, a Gallup poll placed his job approval rating at 66 percent. That is higher than any late-term president in the history of the poll, which dates back to Harry Truman in 1952 -- even higher than the strong ratings of Ronald Reagan and Dwight Eisenhower. The reason probably is obvious. Much of Clinton's 1992 presidential campaign centered on one theme, and so has much of his presidency. "I believe people send presidents to do certain jobs, particularly when there are certain important, pressing needs," Rutherford said. "When Bill Clinton went to Washington in 1993, he had one major objective and that was to turn the economy around, and he delivered." Clinton's role in the economy's remarkable strength of the past decade is the stuff of partisan debate. Republicans insist they kept the president's worst economic impulses in check and that the economy would be even better if GOP-backed economic initiatives were implemented. Still, it is an accepted fact of political life that the president gets the credit when the economy is good, and the blame when the economy is bad. Under Clinton, the economy has been not just good, but very good. The administration has been part of what the National Bureau of Economic Research says is the longest economic expansion in U.S. history. The tax revenues that expansion created have helped as well. In 1992, when Clinton took office, the annual federal budget deficit stood at $290 billion. For the current fiscal year, the surplus is expected to be $256 billion, according to the Office of Management and Budget. That is a swing of more than a half-trillion dollars. Clinton's supporters trace the economic growth to careful tax and spending policies. His detractors point at the explosive growth of the Internet and suggest that Clinton got lucky in some major aspects of the economic growth. Administration officials reject that sort of thinking. "The president has always tried to look at the economy as a place of opportunity, a place where people can build better lives, better futures for themselves, and that businesses could make good judgments about the future and plan for the future in such a way," White House press secretary Jake Siewert said recently. "It's always talked about in a way that takes some recognition of dangers that are out there, but [also in a way that] tries to provide solutions and not just blame and finger-pointing." Clinton is leaving office just as the economy is slowing down -- although, as his supporters point out, it does continue to grow. Clinton campaigned with a promise to be an "education president," saying he had made broad strides in improving education in Arkansas. The administration takes credit for a variety of focused education initiatives, including improved access to Head Start programs for preschool children, providing money to modernize schools and upgrade technology in them, and providing more funds for immigrant and bilingual education. Republicans complained the actions were too Washington-centric. Welfare underwent a major overhaul under Clinton, although the effort had broad bipartisan support. In 1996 the president signed a bill that required some welfare recipients to perform work in exchange for government assistance, and there has been a significant drop in the number of the nation's welfare recipients. In December, Clinton said that welfare rolls have fallen by 60 percent since 1993, resulting in the smallest number of people on welfare in 32 years. Its inability to overhaul the nation's health care apparatus at a basic level may have been the administration's biggest defeat, but there were victories on the health care front. The administration pushed to expand federal funds for children's health care, backed legislation that made insurance more portable between jobs, backed a bill that speeded up Food and Drug Administration review of new drugs and enacted a variety of changes in the federal Medicare program. Violent crime dropped through most of Clinton's administration, although Republicans claimed that demographics may have played a role in that, as the percentage of the population in prime crime-committing ages dropped. Still, violent crime fell 27 percent nationwide between 1993 and this year, according to the administration. Clinton also pushed through the so-called Brady Law that requires a five-day waiting period and a criminal background check for people wishing to buy handguns. When Clinton leaves office January 20, he says he will miss the perks: "I anticipate that for some several months I will be disoriented when I walk into large rooms, because no one will be playing a song anymore." In 1992, President Bush's campaign often referred to Clinton as the "failed governor of a small state," and Bush officials wondered aloud whether Clinton had any skills to muster in the international policy arena. But Clinton leaves office with a record of achievements, including his involvement in the peace process in the Middle East, the end of fighting in Kosovo, and a strong role in the Northern Ireland peace process. He did have some difficulties in international affairs. His efforts involving China have been criticized, the Middle East peace process is in seemingly endless imminent danger of crumbling, and critics worried about his selective use of the military for peacekeeping missions. But his popularity in other countries is relatively unusual for a departing American president. Clinton claims he is looking forward to getting away from the public attention that the presidency brings. He and his wife, Sen. Hillary Rodham Clinton, bought a house in Washington in late December and already own one in New York. 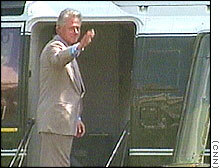 Clinton's presidential library, being planned in Little Rock, is expected to contain a small residence as well -- giving the former president three potential homes. "I expect to make a living, and I'll get out of your hair and get out of the media spotlight and go back to making a living. I'll write a book and do a few other things," Clinton told reporters late in December when asked about his plans. Getting out of the spotlight, of course, may be something beyond his control. Clinton still faces a possible criminal indictment for perjury in the continuing independent counsel investigation; the same perjury allegations may cause him to lose his Arkansas law license; and there still are unresolved civil suits involving the president. But it is also worth noting that Clinton, at 54, will be an extremely young former president -- younger than most men who attain the presidency. In fact, he is the same age as his successor, George W. Bush. In contrast, Ronald Reagan was nearly 70 when he took office. More than a few Democrats suspect that Clinton is not going to be a quiet former president. That would be in keeping with the man. Bill Clinton has been underestimated many times. It would be a mistake to do so again. Randy Lilleston is senior editor of CNN allpolitics.com. A former writer and editor for the Arkansas Democrat-Gazette in Little Rock and Congressional Quarterly in Washington, he has covered Clinton for 15 years.